As much as I love seasonal decorating, I have to be careful not to do too much too soon or it will drive me crazy. I am slowly putting summer away and bringing Fall into focus. 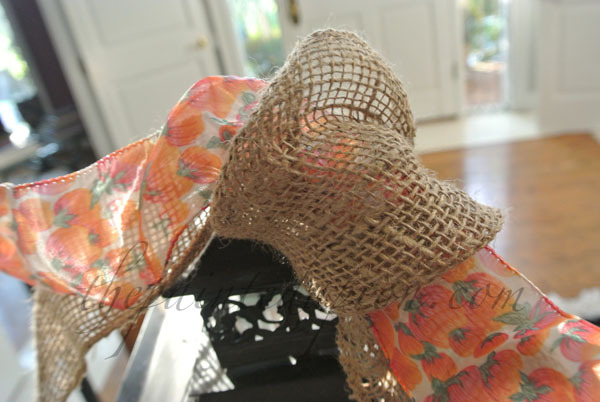 Burlap is a decorator’s best friend right now. 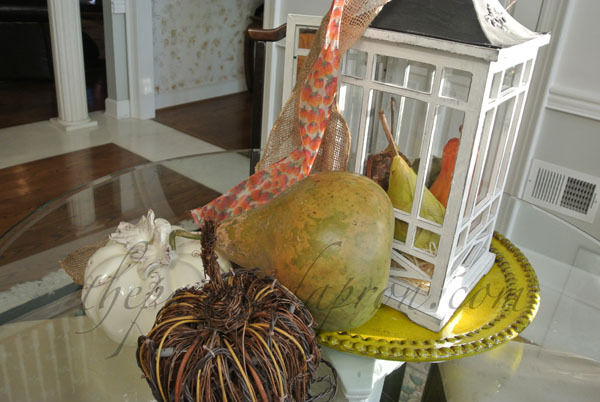 It is available in so many forms and colors and it instantly adds a fall feel and an on trend touch. Fall abundance? Opening your door to Fall? Surely there is a deep heavy message here! You never know what’s going to fly in when you leave your door open! 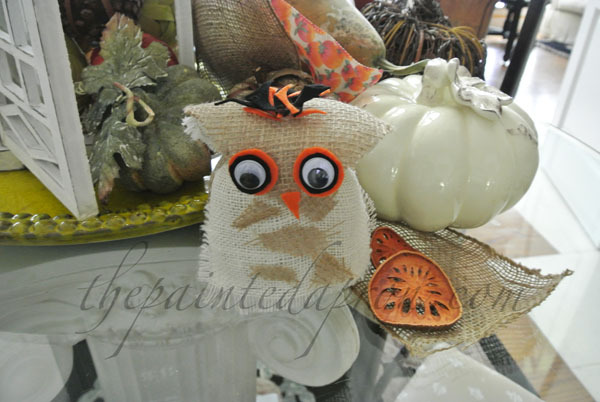 Come back soon and I’ll show you how easy it is to make a cute little burlap owl! Clever idea! 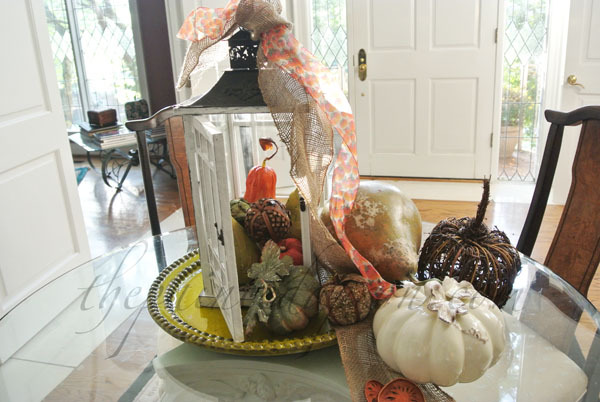 The use of your lantern with the fall pieces tumbling out on the table is beautiful. The little owl adds a whimsical accent! Thanks for sharing! Looks great … giving me good ideas … have some bird cages that I can use, but the lantern would look much better. Love your vignette, that owl is too cute! 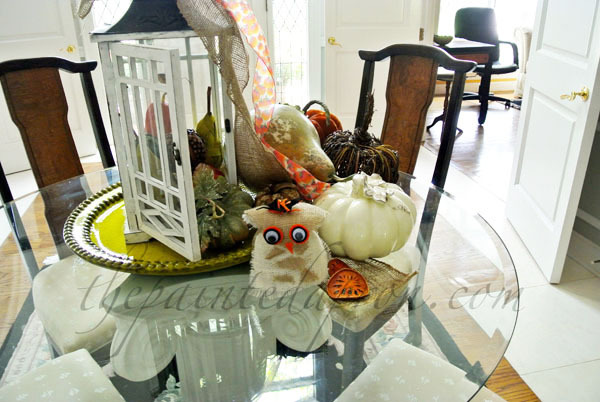 I will use this idea of filling a lantern – your arrangement on the glass table looks great and that owl is adorable. 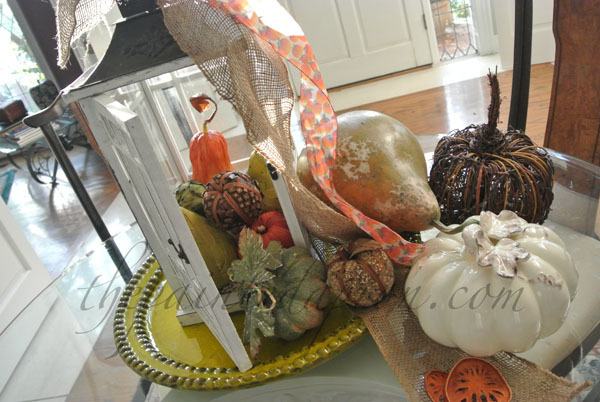 I love the textures and colors of your centerpiece! I wish I had a large lantern! I have several small ones, but you really need a larger scale for gourds and pumpkins. I enjoyed the colors you used, too! The owl is so adorable. This is the first year I got an owl decoration for the house. I also put my pumpkins and mums outside. 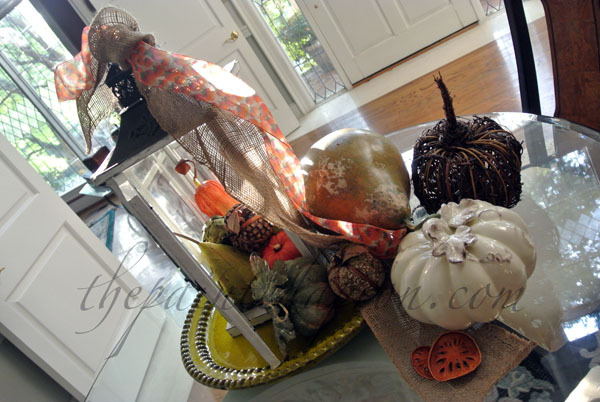 I love decorating for the fall!